Ness needs to be unlocked. 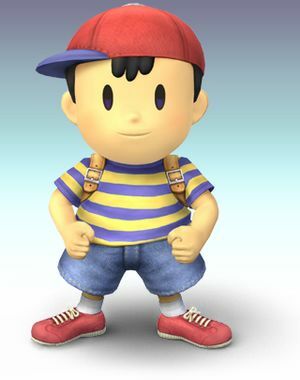 Ness is the 13-year-old psychic boy who is the hero of EarthBound on the SNES. Although he is small, he can be lethal when used correctly. Especially his PK lightning. Aim the PK lightning to ness and blast him through enemies. This attack will kill anyone who is 50%+ it is much harder to control than lucas's. His PK Flash is used for people who are caught off guard and people who are falling down. It also finishes people who are 50%+ in other words, great for 2 on 2. Punches two times and then kicks. Low knockback makes this not very good, but it's fine for a quick 9%. You can gab lock with this moves first punch, but it is difficult to set up and keep it going. Kicks out in front of him. Can be angled. It does more damage than the neutral A attack, so it is a better choice. Thrusts his hands upwards. This move can be used to juggle opponents at low damage. Kicks while crouching. This move is very fast and causes tripping. Basically Ness's equivalent to an infinite combo, but you have to keep pressing it instead. Best if you can pin an opponent on a wall with this. Easily Ness's fasted move. Shoots PSI from his palm. Although its range is better than just using the up smash in a dash, it is usually better to use the up smash in a dash, as the up smash has a larger hitbox and more damage than this. Edge Kick/Edge Punch Damage:Bold text below 100% damage,10% above 100%. Ness gets up from the edge of a stage and kicks if below 100%, but punches if above 100%. Usually better to jump off the ledge into an aerial. Ness's up and down smash's charge is unique as its only to hold the attack out longer and doesn't increase its damage and knockback. Smash + + + (Smash + ) or (Smash + ) or Bat Smash Damage:18% on handle uncharged,24% on tip of bat uncharged,25% on handle fully charged,33% on tip of bat fully charged. Ness smashes his bat. Takes time to charge but is Ness's most powerful smash attack. Damage depends on the part of the bat you hit the opponent with. It has a little starting lag but is pretty fast for a smash attack. Smash + + + (Smash + ) or (Smash + ) or Yo-Yo Arch Damage:4% while charging,4%,9% if hit directly where it starts,13% if it hits above Ness's head or behind ness. Swings a yo-yo above Ness's head. It is good for a bit of damage, and will almost always hit with 13%. This and Ness's down smash are the only smashes that can do damage while charging, with charging the Yo-Yo spins, doing 4% and launching them into the rest of the attack. Smash + + + (Smash + ) or (Smash + ) or Yo-Yo Swing Damage:4% from charging,13% in front or behind Ness. Swings a yo-yo around Ness's feet. Unlike most down smashes, this one starts behind Ness instead of in front of him. Just like Ness's up smash, charging doesn't increase damage done, but instead allows damage to be done while charging. Ness headbutts the opponent. It's good to get in a few of these in on every throw, but only do 3 or 4 maximum, for this gives the opponent a chance to escape. A very fast pummel. Swings his opponent away. The strongest throw at 0% damage, it has huge knockback at 0%, but terrible knockback as damage increases(sometimes not even able to kill at 999% damage). Use at low damage, but use back throw instead at high damage. Swings his opponent behind him. This move becomes the strongest throw in the game at higher percentages. Use it after opponents get about 100% to KO, but can combo easily at low damage. Twirls the opponent and sends them upwards. Just like Ness's forward throw, just 1% less damage and throwing them up. Don't rely on this to KO, as it needs to be at at least 225% to kill unless you are close to the top of the stage. Uses PK Fire on the opponent. It is good to combo into a forward aerial at low damage, and good in team to let your teammate smash attack the opponent if team attack is off. Spins around hitting with his hands. It is almost impossible to hit the same opponent with both hitboxes, but has good knockback and can kill at around 125% or near edges of the stage. Use to KO when you can't hit with a back aerial. Blasts PSI from his palm. It is pretty easy to hit with all 5 hits, so it is good for damage and can be combo-ed into several of these in a single set of jumps. Great for using to get back on the stage and hit an opponent trying to edge-guard you. + + + + PSI Kick 15% if sweet spotted,8% if sour spotted. Kicks behind him. Powerful if sweet spotted. Ness's best aerial for both damage and knockback if sweet spotted, which is easy to get, whereas the sour spot is hardest to get. The sour spot is if a little time passes from the start of the attack, but this attack is fast so most of your hits should be sweet spotted. Ness headbutts his opponent. Good vertical knockback at high damage and can easily kill near the top of a stage around 50%. + + + + Leg Stab Damage:12% for meteor smash hitbox,9% for other hibox. Kicks downwards. This move is a great meteor smash. If you are good at performing the meteor smash, use it a lot. The other hitbox will knock the opponent to the side and can also kill easily. PK Flash Damage:9% if uncharged,37% if fully charged. Shoots an orb energy that charges if you hold the B button down. Deals immense damage and knockback when fully charged. Only ever use in team while opponents are distracted or to edge guard, as it is very slow. + + + + PK Fire Damage:2%,2%,2%... up to 24%, so it can hit 12 times. Shoots a beam that bursts into a pillar of flames when it hits an enemy. Unlike Lucas's PK Fire, if Ness uses in in midair it will travel diagonally downwards. If it hits in midair, the flame will also travel slowly downwards. It is good at low damage to deal a lot of damage and to hit them with another move while they are stuck in it, but don't spam this as it is easy to get out of and it will only do 1 hit for 2% at about 50% damage. + + + + PK Thunder Damage:1% for the lightning bolt's "tail",8% for the lightning bolt hitting an opponent,21%-25% for when Ness gets launched from it. Shoots a lightning bolt that can be steered back at Ness to shoot him to a direction and cause powerful damage or used to hit other characters. It kills anyone above 50% if it hits an opponent from launching Ness. The actual lighting bolt has very high knockback for such a weak move, and it is good for edge-guarding or hitting opponents you launch upwards. However, it is easy to dodge and leaves you completely vulnerable, so be careful. The only bad thing about this is it is hard to control and the lightning bolt disappears when it hits something, leaving you in the helpless state unlike Lucas's PK Thunder, which goes through characters once or twice and is easy to control. + + + + PSI Magnet Healing Done:Depends on the projectile and how long the same PSI Magnet is up. Absorbs damage from energy-based projectiles and heals Ness. Against characters with great energy projectiles such as Falco, Fox, and Wolf, this is great as it stops them from using some of their best strategies. The healing is at first equal to the damage the projectile does (meaning the least healing is from Fox's blaster because it does the least damage, and the most healing from Lucario's fully charged aura spheres while he's at his highest damage), but then gets lower over time for how long the same PSI Magnet is up. It does not absorb projectiles from Link, Snake, Ice Climbers, Mr. Game and Watch, and Samus (except Samus's neutral B), so be careful. Also, it does no damage and only barely pushes away opponents if released right next to them, but it isn't enough pushback to save yourself from being hit with a move. He nods to the camera and says "Okay!" + ( or )+ or or He holds out his bat. + He finally swings his finger around, making PK sparks. PK Starstorm: Damage:20% per star. Ness's final smash is similar to Lucas's but with blue stars instead of yellow ones. Also, the stars come down in more of a fan-shaped pattern. It is most successful on smaller stages. 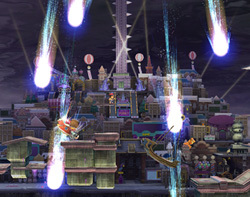 However, in large stages such as New Pork City, Ness's final smash could be easily avoided in combat. Also note that Ness's final smash is stronger than Lucas's, but inaccurate. Bowser is slow but can deal a lot of damage. An easy way to rack up damage is to jump nice and high then use PK Thunder. If this hits then Bowser is stunned for a bit allowing you to fall down then jump up and repeat the process. Try and stay away from Bowser as his Fire Breath can be absorbed by PSI Magnet, so he has no ranged attacks. None of his attacks can be absorbed by PSI Magnet. He is a lot faster than Bowser. Use the same strategy to rack up damage as you did for Bowser, but you will probably have to do a bit more air-navigating. This is a hard fight. Mario is quite fast, but can have some weak attacks. PK Thunder is not much use here as Mario can use Cape to deflect it, so don't be afraid to get up close and engage in close-range combat. You can also absorb Fireball with PSI Magnet. This page was last edited on 2 January 2015, at 19:13. This page has been accessed 45,050 times.